PHOENIX – Six years ago, it was a young intern who helped save Congresswoman Gabrielle Gifford’s life in a shooting that shocked Arizona and the nation. Now, that same intern has made history again by helping to found the first LGBT Caucus in the Arizona Legislature. Daniel Hernandez, who now represents District 2 in the state House of Representatives, said he and some of the other founders — Tony Navarrete and César Chávez — used to get together for dinners and joke that they were the ‘gaucus,’ or the gay caucus. They, along with state Senator Robert Meza, began to think about creating something more formal. Hernandez said they looked to other states to see what they were doing. Hernandez said they adopted the bylaws from other states, like California, and began to reach out to relevant stakeholders in the community to see what their priorities were. The caucus was officially announced on Oct. 11, which is also National Coming Out Day. 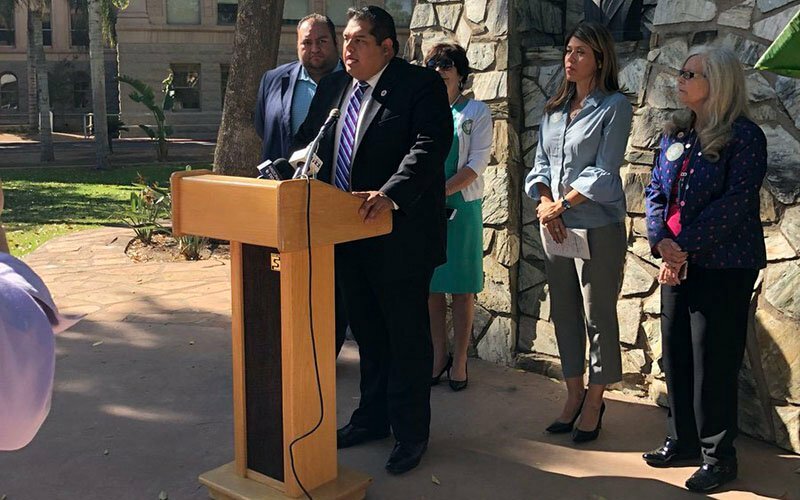 “I think SB 1062 was a big sign and a big show of force for the LGBT community, that we know how to build partnerships with not just traditionally allied groups that are in the social justice realm, but really, the business community,” Hernandez said. SB 1062 was a bill from 2014, which then-Gov. Jan Brewer vetoed after an intense outcry from Democrats, Republicans and major corporations. If passed, it would have allowed businesses to deny people services based on religious beliefs. Similar laws in other states have been used by Christians to exclude LGBT people. Such was the case in Indiana with the Religious Freedom Restoration Act, which allowed for-profit businesses to assert their right to free exercise of religion. This could, in theory, mean doing something like denying serving food to a gay couple in a restaurant if your religious beliefs dictate that you disagree with people being gay. Dante Mitchell, an Arizona State University student and a vice chairman of the Arizona Democratic Party, hopes the caucus can help legitimize LGBT issues. He hopes the caucus will prioritize employment status. Currently, Arizona is one of the states that has no protections for LGBT workers, meaning that someone can still be fired for being openly gay. Hernandez also listed housing and working protections as a priority for the caucus. Mitchell said he hopes having openly LGBT members of the state legislature will help deter other representatives from passing discriminatory laws. Mitchell also has an interesting connection to Hernandez, whom he has admired for a while. When he was in high school, there was controversy about Hernandez giving the commencement speech on campus, since he is openly gay. Ultimately, Hernandez was able to give his speech, but that story stuck with Mitchell. Mitchell said while things are better than when he was first started high school, there is still a need for improvement. He hopes this caucus can allow candidates and elected officials to prioritize the LGBT community and, specifically, be LGBT leaders. “I think it’s really great that it gives our leaders a choice and a platform to be a leader in policy and have that LGBT connection to it,” he said. As a fellow local political leader, Mitchell also wants to use his role to address the concerns of the LGBT community. Hernandez hopes to inspire more people like Mitchell by being outspoken about his identity. He said people in his life have repeatedly told him it would be easier for him to be more quiet about his sexuality since they think he already has one strike against him for being Latino, but he’s never listened. He said he hopes being outspoken can help people be more open-minded. He added that role models, who like him were Latino and gay, were rare when he was growing up. Even though all the founding members of the new caucus are Democrats, some members from other parties agree with the cause. David Howman, president of the Arizona State University College Libertarians group, said the representation of LGBT people in the state Legislature is a good thing. “I think that we do need to have a better representation of all of our different population groups within Arizona, but also specifically with regard to LGBT,” Howman said. He said securing marriage equality has been a platform of the Libertarian party since its inception in the early 1970s. However, just because that right is secured, for now, it does not mean the fight is over, Howman said. Hernandez also thinks further progress needs to be made for the LGBT community. He knows it won’t be easy to accomplish all that he wants to get done and that it might take years before a bill that helps secure employment rights is passed. However, that’s not stopping him. “I think for those of us who have been doing this for more than a day or two, you realize that if you’re doing something that’s worth doing, you’re going to have detractors, you’re going to have people fighting against the things that you’re trying to do,” Hernandez said.